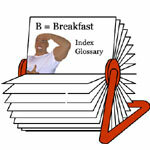 The Breakfast Report at breakfastreport.com, was created to act as home page for breakfast lovers. It featured the day's top headlines, horoscopes and daily breakfast specials along with links to the most commonly visited sites on the web. After a trial run, it became clear that Mr Breakfast should stay out of the business of providing news headlines and horoscopes and stick to what we knows best, providing people with breakfast recipes, breakfast articles and breakfast restaurant reviews.